Climbing, abseiling and caving are natural team building activities. Goal-oriented and requiring cooperation, trust, good communication skills and problem solving under pressure. Our facilitators provide your organization with activities that will enhance and change the way each person views themselves, their coworkers, and the team as a whole. Team Building with us is more than just climbing: we customize our programs, offering a highly-structured, motivational agenda or a relaxed curriculum and of course, the thrill of challenging both the rock and your fears! 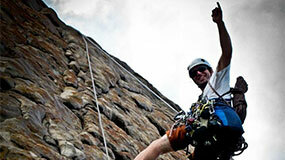 Contact Mick at info@margaretriverclimbingco.com.au for more information and to organise a custom quote.